The modular VacuDAP dose-/dose area product measuring system offers various ionization chambers and configurations for almost all medical diagnostic X-ray equipment in radiography, radioscopy, dental application or whole body scanners. All complete systems have a serial interface RS 232 on the display unit for connecting a printer or transmitting data to a workstation or RIS. 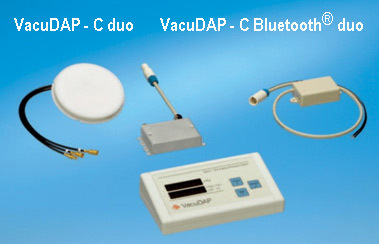 The VacuDAP Systems are used for simultaneous DAP (dose area product) and DAP rate measurements according to IEC 60580. The VacuDAP duo systems additionally determine reference air kerma and reference air kerma rate in accordance to the standards IEC 60 601-2-54, IEC 60 601-2-43 and 21 CFR 1020.32. All measuring chambers provide a serial interface RS 485 to transfer measuring data and to receive control commands by means of an ASCII protocol. Optionally the system is available with Bluetooth® wireless technology. The measuring chambers can be completed with several display units to many different stand alone systems to match all X-ray systems and official requirements. Chamber resolution of 0.01 µGy·m2 for DAP enables them for use in pediatrics. All rectangular chambers are available with an active area of 123x123 mm or 147x147 mm. 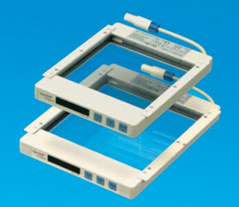 They are adaptable to all common X-ray collimators by means of different rails. The circular chambers are designed and the calibration is set to meet the specifications of the C-arm X-ray machines. two-line version for the parallel connection of two measuring chambers (twin). The measuring chamber VacuDAP Bluetooth® in connection with a Bluetooth compatible display unit saves the expense of cable installation between the measuring chamber and the operating desk and assures the same function as VacuDAP fluoro. The configuration with circular ionization chamber was developed for full integration into C-arm X-ray equipment. The systems are designed and the calibration is set to meet the specifications of the equipment. The electronics supplies the measuring results as ASCII protocol via a serial interface to the display unit fluoro. For fast and easy installation the circular measuring chamber VacuDAP-C in connection with an additional Bluetooth adapter can be used with a Bluetooth compatible display unit. The display unit "Dose/DAP" is available as a Bluetooth version as well. The measuring chamber VacuDAP Bluetooth® duo in the picture is presented with universal adjustable mounting rails. 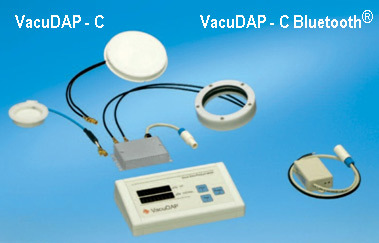 The circular two field measuring system VacuDAP - C duo determines reference air kerma, reference air kerma rate and DAP, DAP rate and irradiation time. The data and control commands are transmitted via serial interface between the measuring chamber and the display unit "Dose/DAP". 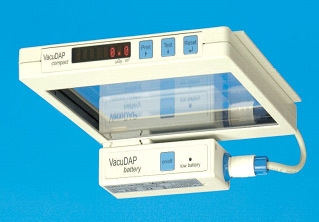 VacuDAP-C duo in combination with a plugged Bluetooth adapter are used with a Bluetooth compatible display unit to avoid cable installation between the measuring chamber and the operating desk. This is a compact unit designed for uncomplicated retrofitting and is equipped with an integrated display and control keys directly attached to the measuring chamber. A model with reduced dimensions is available as a special type for mobile X-ray units having smaller collimators. 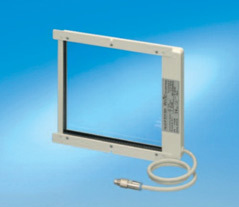 A secondary display unit that provides RS 232 interface can be connected to VacuDAP compact and acts as remote control. The measuring chamber can be plugged easily into an existing pulse counting interface that is provided by several generators on the market. 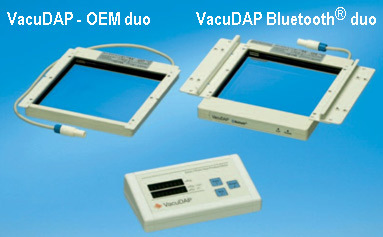 Two chamber sizes are available equivalent to the other versions of VacuDAP. The VacuDAP compact in combination with the battery is the first complete stand alone DAP system and ideally suited for mobile X-ray units. The battery pack is also best suited for use with VacuDAP Bluetooth®. 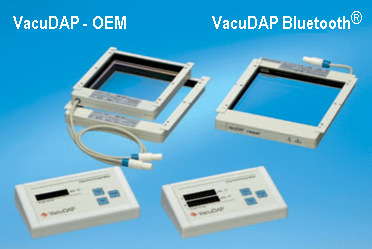 The rugged mechanical adapter allows the use of filters in combination with the measuring chamber. The converter provides the supply voltage from a primary SELV of 20 ... 50 VDC or 14 ... 35 VAC. Interface cable with integrated RS 232 converter are available with different lengths in increments of 5 m.
Allows operation of VacuDAP in an ISO 11898 compliant bus. The label printer Zebra LP2824 and the low cost thermal printer Seiko DPU414 can be used at the serial interface to print a protocol. Rails for fixing the rectangular measuring chambers to a collimator are available from 140 mm to 190 mm width.